Karlsruhe, Germany, February 15, 2018 / B3C newswire / -- Vetter is one of the winners of the clean manufacturing award CLEAN! 2018. The pharmaceutical service provider was able to convince the independent expert jury of the Fraunhofer Institute for Manufacturing Engineering and Automation (IPA) with its innovative Vetter CleanRoom Technology V-CRT®. The prize was awarded as part of the LOUNGES 2018, an associated trade event in the clean manufacturing sector. With the CLEAN! 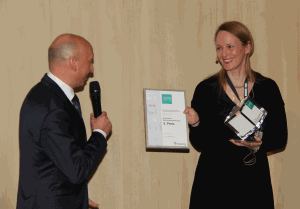 award, the Fraunhofer IPA honors groundbreaking developments in clean technology. "The production of active pharmaceutical ingredients, microchips or nanoproducts would be unthinkable without a high-purity manufacturing environment," says Dr.-Ing. Udo Gommel, Head of Department Fraunhofer IPA. "Vetter drives innovations in aseptic production and thereby increases the competitiveness of its customers. This achievement is honored by the Fraunhofer clean manufacturing award CLEAN! 2018." Important award and evaluation criteria included innovation leap, sustainability and industrial feasibility of the application concept. The Fraunhofer IPA is an institution of the Fraunhofer-Gesellschaft, Munich, that promotes applied research. It is particularly concerned with the development of sustainable and pioneering products. Bernd Stauss, Senior Vice President Production/Engineering at Vetter, is proud to say: "We continue to develop our technologies to meet the complex and ever-increasing demands for quality and flexibility in pharmaceutical manufacturing. We are very pleased that this has now been honored with the Fraunhofer clean manufacturing award CLEAN! 2018 for our cleanroom concept V-CRT®." V-CRT® is a holistic manufacturing technology developed by Vetter for the safe aseptic filling of injection systems. The innovative approach combines the advantages of isolators with Restricted Access Barrier Systems (RABS) and is based on the idea of fully automated decontamination of the entire cleanroom with hydrogen peroxide (H2O2). The result is the highest possible safety in the prevention of contamination as well as a flexible production process. Following the successful commercial implementation and validation of V-CRT® in 2017, the technology will be used in all cleanrooms at Vetter by 2025. Caption: Dr.-Ing. Udo Gommel (left), Head of Department Fraunhofer IPA hands over the clean manufacturing award CLEAN! 2018 to Dr. Ute Schleyer, Project Manager Plant and Site Development at Vetter.